Are British Columbia's forests well managed? What is Sustainable Forest Management (SFM)? Want to learn more about the history of SFM? How to solve public disputes on forests? In British Columbia, a dispute continues over just how sustainably managed are British Columbia’s publicly owned forests covering some 55 million hectares of the province, which is 94 million hectares in size. 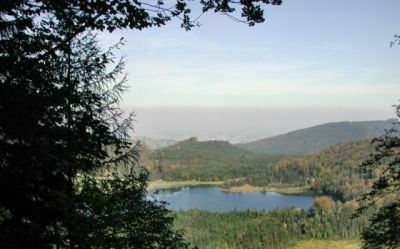 At the heart of this dispute is the extent of productive forestland disturbed by wildfires, wind, diseases and insects that is not stocked with trees. Over the last decade, some 17.5 million hectares of lodgepole pine forests have been infested by the mountain pine beetle. The beetle infestation has not been confined to mature forests but has also affected immature pine forests. Over that same decade, British Columbia has seen some of the worst years for wildfire in recorded history with over a million hectares having been denuded by wildfire. With an inventory that is over 15 years old for much of the province, questions are being asked about the provincial extent of the not stocked area, which has implications for the rate of harvest, for carbon accounting, for sustainable forest management, and for forest certification. VICTORIA (June 26, 2012) – The total area of BC’s provincial forests that may need to be restocked with healthy young trees could exceed current reforestation efforts by more than one million hectares, according to a Forest Practices Board report released today. 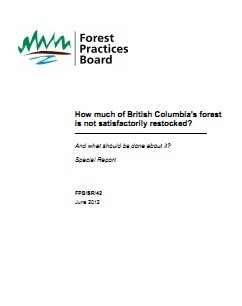 The report indicates that almost two million hectares of Crown forested land could potentially be “not satisfactorily restocked” (NSR). Of that, nearly half a million hectares will be restocked by industry and government has current plans to restock about a quarter of a million hectares. Government has a reforestation program for these areas, but to date it has only directed limited effort at re-stocking mature, beetle-affected forests because those areas might still be harvested – and eventually restocked – by the forest industry. The Board has made recommendations to government that it hopes will promote a useful dialogue on the topic of restocking British Columbia’s forests. In this year's budget debate for the Ministry of Forests, Lands and Natural Resources Operations (MFLNRO), the loyal Opposition posed some really interesting questions on topics that really matter to British Columbians; topics such as wildfire protection surrounding communities; TFL tenure; industrial water usage and fees (e.g., for fracking) and sustainability of forest management especially with respect to forests, animals and habitat. As a registered professional forester (retired), I find many of the Minister's answers to questions from the loyal Opposition to be weak failing to inspire confidence in how the government is managing our publicly owned natural resources. In particular, it appears that the government is failing to charge enough money in fees and rents for natural resources, which means it is not asserting the financial interests of the public because it is essentially giving away the natural resources. Without sufficient revenue, the government is failing to invest in the land and chooses to see stewardship activities like tree planting and inventory as expenses that can be cut instead of as necessary investments that must be maintained in order to generate future revenues to fund education, health and other social programs. 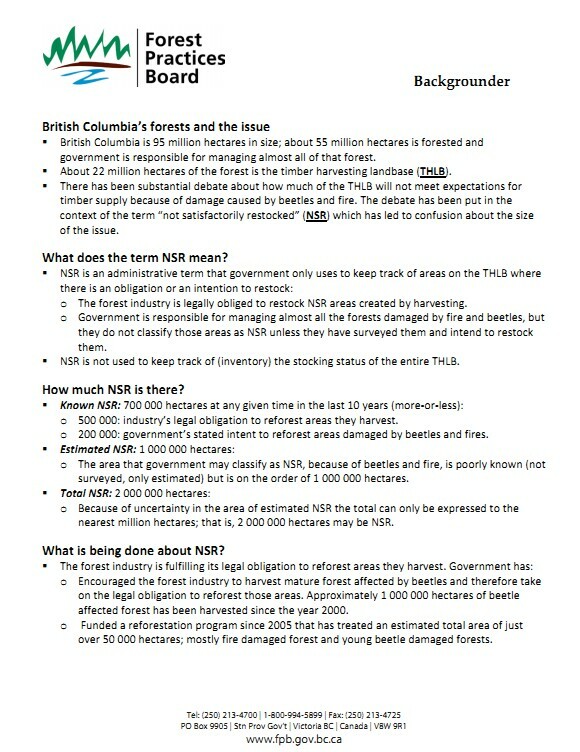 This year the government cut the MFLNRO budget by $40 million targeting forest stewardship with $35 million or 88 per cent of the cut. For example, before 2000 the forests ministry spent more on tree planting alone than it does today on all these stewardship activities combined: tree planting; inventory; silviculture; research; tree improvement and genetics; monitoring and treatment of insects and disease; fresh water management; timber supply analysis and AAC determination; watershed restoration; fish, wildlife and habitat management; land-use planning; visual quality management; and climate change. This fact alone should be enough to outrage every British Columbian concerned about the economy, job security and a secure future for our children. Given the global pressures of an unstable financial system and climate change, British Columbia's long-term economic security will depend on how well it cares for its renewable natural resources today because they, not the non-renewable resources, have the potential to provide for economic resiliency in an unstable global economy. Anthony Britneff, retired after 39 years of public service with the B.C. Forest Service is still worrying about British Columbia’s forests and is therefore a valiant champion of the sustainable management of forests of his homeland. British Columbia Auditor General John Doyle has released his latest report, An Audit of the Ministry of Forests, Lands and Natural Resource Operations’ Management of Timber. Nearly two-thirds of British Columbia’s 95 million hectares is forested. These forests contribute to employment, tourism and recreational opportunities, as well as generate significant revenue for government to finance public services. However, trends indicate that the future availability of timber will be smaller and less diverse, putting future revenue opportunities at risk. Stewardship responsibility for these forest resources lies with the Ministry of Forests, Lands and Natural Resource Operations. The commitment to using wood first. Growing trees, sequestering carbon, and ensuring land is available to produce a range of forest products. Creating a globally competitive, market-based operating climate. Supporting prosperous rural forest economies. First Nations becoming partners in forestry. The full, devastating impact of the pine-beetle epidemic that has swept across British Columbia will be felt in the next few years when up to half the forest-industry jobs in the province’s interior will vanish, according to a government report meant to be confidential. The document, a briefing report for the provincial Forests minister, was inadvertently posted on the internet. It gives details on the unfolding timber supply crisis that threatens “the short and medium-term sustainability” of communities that have depended on logging for generations. In response to concerns expressed by local communities, Ministry of Forests, Lands and Natural Resource Operations staff have been analyzing potential opportunities to increase timber supply. Ed Mankelow has been involved in B.C. parks protection and establishment since 1961. He was the chair for many years of the B.C. Wildlife Federation’s parks committee and past chair of the Canadian Wildlife Federation’s parks committee. His role has always been to protect the parks and wilderness. The BC government says it is opening the door to the idea of logging old-growth forests to help boost timber supply. Forests Minister Steve Thomson insists any decision to cut would be based on science and would only be done if consensus was reached from all members of the community. As many as eight sawmills face closure as the timber supply grows thin. Examining the old-growth potential in central BC is just one of several actions the province plans to take. For reaction to the government's plans we have reached Anthony Britneff. He is a retired professional forester who spent 40 years with the BC forest service, where he held a number of senior positions. He is still a registered professional forester in Victoria, where we have reached him at his home this morning. Given the short duration of the upcoming legislative session and the provincial election to follow, a government plan to introduce a scant two-paragraph bill granting it powers to fundamentally alter the course of forestry in B.C. is disturbing, to say the least. 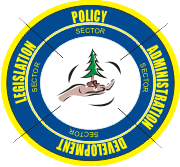 According to several sources who have been briefed on the legislation, the bill would give the provincial cabinet powers to grant forest companies de facto private control over public forestlands without first having to notify or consult with the public. Instead of companies enjoying rights to log set volumes of trees on public forestlands, companies would gain dramatically expanded powers to log trees on defined areas that in effect become their own semi-private fiefdoms. The bill follows a year in which the government has faced mounting criticism over a forest-health crisis due to decades of over-cutting and an unprecedented mountain pine beetle attack. Numerous sawmills now face closure, with all the hardships that portends for many rural communities. It also follows the losses of sawmills in Burns Lake and Prince George due to explosions and ensuing fires. In the wake of those events, various government documents were leaked indicating that the provincial government was revisiting a controversial “rollover” idea first pursued 25 years ago. At that time it met with such a groundswell of political and public opposition that the initiative was scuttled. I'm writing in response to Ben Parfitt's speculative and misleading Jan. 27 op-ed about upcoming proposed forestry legislation. Here are the facts: On Aug. 15, the bipartisan committee on timber supply released its unanimous report after visiting 15 communities and reviewing over 650 submissions. One of its recommendations was to enable the conversion of volume-based forest licences to area-based forest licences. On Oct. 9, I released Beyond the Beetle: A Mid-Term Timber Supply Action Plan - the government's response to the report, which contains the commitment to introduce legislation and states, "one requirement for any proposed conversion will be ensuring that the public interest is addressed, through the support of the local community, First Nations, stakeholders and the public." To reiterate: a public commitment in response to a public report, with public consultation needed before implementation - certainly not sneaky in my books. In response to Ben Parfitt’s op-ed about the B.C. 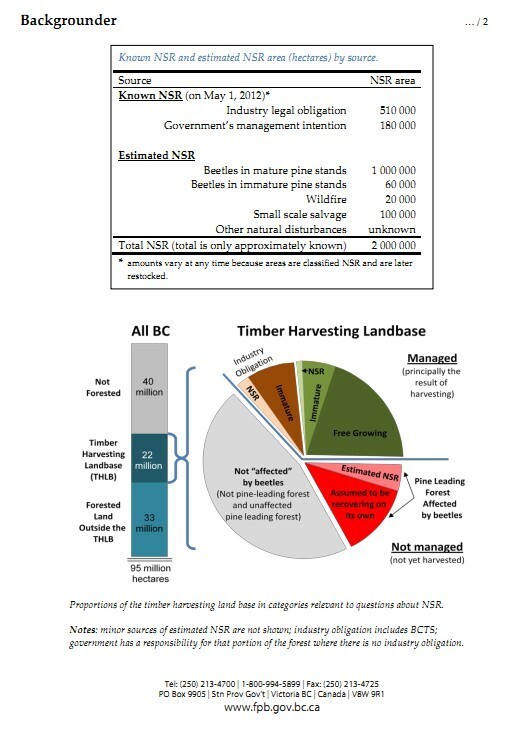 Liberals’ intention to introduce legislation to rollover replaceable volume-based timber licenses to area-based tenures, the forests minister claims as a “fact” that the legislation stems from a recommendation from the special committee on timber supply that toured B.C. last summer. According to a leaked cabinet document, the “rollover” of volume-based licenses to area-based tenures was recommended to cabinet in April as an option to enable the rebuilding of the Burns Lake sawmill — a month before the committee was formed and five months before it made its recommendations public. The committee did not “in fact” recommend the conversion of volume-based licenses to area-based tenures. Rather, it gave significant and thoughtful cautionary recommendations “if conversion to more area-based tenures is desirable.” The committee found there is still no consensus on the relative merits of area-based tenures and significant concern about the potential privatization of our largest public asset. The minister also gave Hampton Affiliates a “letter of intent” in September committing to the conversion of this U.S. company’s volume licenses to area-based tenures — a full month before he publicly released a response to the committee’s recommendations. The fact is: the Liberals were on the rollover path long before any public process. Enabling legislation will not guarantee in law any defined public process in the rollover decisions. It is used to give politicians “flexibility” to take actions without the constraints of law or guiding regulations. Used inappropriately, it can be a very “sneaky” instrument indeed. We must oppose giving politicians the unfettered right to radically alter forest tenures or to privatize our public forests. I certainly intend to do that in this upcoming session. It would be nice to know if the NDP will join me in this fight. Forests Minister Steve Thomson takes issue with the “highly speculative” nature of my recent op-ed in which I suggest that the provincial government intends to grant cabinet open-ended powers to give forest companies de facto control of public forestlands. He does not quibble with the fact that legislation is, in fact, coming, but says that government will be open and accountable by “ensuring” that the public is consulted. But will public consultation be enshrined in law? That’s the question. If Mr. Thomson wishes to end speculation that the interests of First Nations, communities and other stakeholders could be circumvented in the upcoming bill, he should simply publish the contemplated legislation. I would consider it a public service and a small price to pay to be proven wrong.